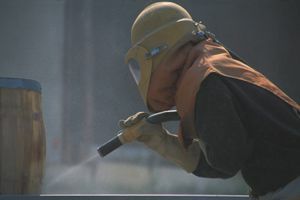 Where do you need Sandblasting Services? Comment: Sand blast exterior painted wall xxxbe 100â wide by 45â tall. Common brick. Comment: I would like to get an estimate for sandblasting a baptismal pool at our church. Comment: I would like to get an estimate for exterior sandblasting. Comment: I have 3 empty Military Ammunition cans I would like to be sandblasted. Specialty Painting & Sodablasting, Inc.
Chicago Sandblasting Services are rated 4.82 out of 5 based on 23 reviews of 7 pros. Not Looking for Sandblasting Service Contractors in Chicago, IL?